Born in Montemorelos, NL, Mexico on March 30, 1946. 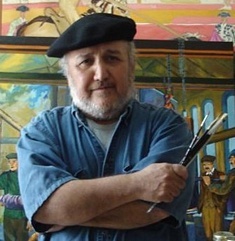 Cesar Garcia Cavazos has been a prolific and successful painter throughout Mexico. He studied with Francisco Moreno Capdevilla and at the famed Academia de San Carlos in Mexico City. After this he collaborated in some of the murals painted in the Museo Nacional de Antropologia e Historia in Mexico City as well as some others in various institutions around Mexico. His work has been exhibited widely in Mexico, Spain, Cuba, Switzerland, and the US. No stranger to philanthropy, he has also contributed with charitable foundations like "El Hogar de la Misericordia" for their fund raising efforts along with Rafael Calzada, Julio Galan, Guillermo Ceniceros among others. He has been recognized with several awards from the Universidad Nacional Autonoma de Mexico, the City of Monterrey and Arte A.C.